As you probably heard, Brad Childress was sacrificed by the Minnesota Vikings Monday. I say "sacrificed," because if you think Brad Childress was the problem in Minnesota, you're drinking whatever Kool-Aid has been passed around this state like the common cold. That's unfortunate, because it masks you from reality. Look at the above graphic from NFL.com. Tell me what the guy in 32nd place has done that no one else on the list has done, outside of rookie Sam Bradford. That's right ... he's gotten through the entire season without once being benched for performance. At his introductory press conference, interim Vikings coach Leslie Frazier -- using strings being pulled by owner Zygi Wilf, a man who knows about as much about building a successful NFL organization as I do about building a mall -- made it clear with "no hesitation" that Brett Favre will remain his starting quarterback. 1. What in the blue hell are Tarvaris Jackson and Joe Webb doing on the roster? 2. What have Childress and Rick Spielman been doing the last three years instead of finding and developing a franchise quarterback? 3. Who was the idiot that thought they should trade Sage Rosenfels? Of course, I'm just obsessed with Favre, so I'm not allowed to point any of this out. Sorry for mentioning the inconvenient truth. Maybe he'll magically turn it around now that Darrell Bevell is calling plays without restriction from that idiot former head coach. MADISON, Wisc. -- What a bat(bleep) game that was Friday night. Up and down action, bad goaltending, good goaltending, great drama, bad officiating, and a UMD win. The Bulldogs won 6-5 in what was easily the most controversial game to this point in a crazy season. Was Mike Connolly guilty of a trip before the game-winning goal? UMD coach Scott Sandelin doesn't think so. "I thought it was a great effort play," Sandelin said in an interview that will air on our pregame show. "Mike made a good play, got to the puck. Gardiner was kinda leaning that way." You can hear more of his take on the pregame show, live at www.94xrocks.com. With losses by No. 2 Boston University, No. 3 Maine, and No. 4 Nebraska-Omaha on Friday, it's possible that UMD will retain the No. 1 national ranking even if they lose a close game here. Of course, we could always just not leave that to chance. MADISON, Wisc. -- Here we are. No time to chat. For the No. 1 UMD Bulldogs, road challenges don't get much bigger than this one. 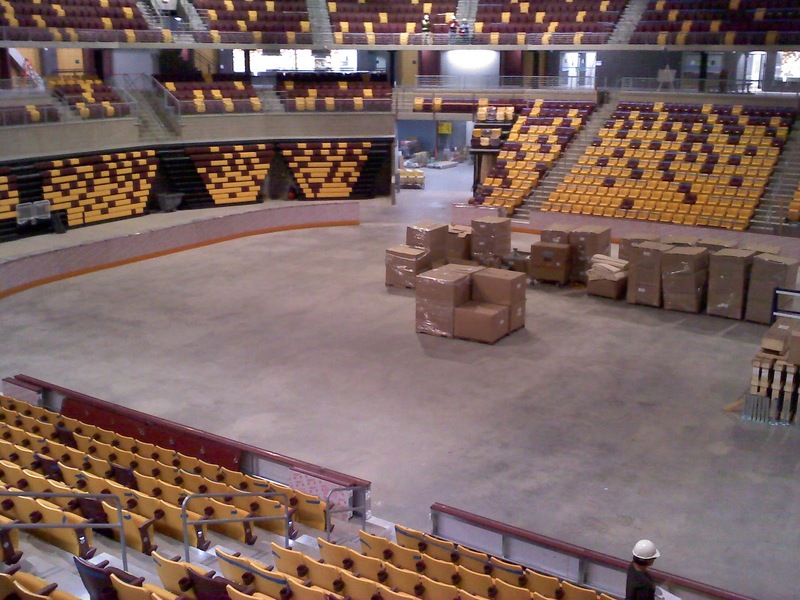 One of the WCHA's tougher buildings to play in is on the docket for this weekend. To make things even more difficult for the visitors, they come in fresh off their first No. 1 national ranking in six years, they're in the lead in the WCHA standings, and they are facing a pissed-off team that just got swept at home by North Dakota. So, no, this won't be easy for UMD. Of course, saying all of that seems forgetful of the fact that the Badgers aren't exactly going to have an easy time dealing with UMD. As we mentioned earlier this week, UMD's coaches and players aren't going to run from the fact that they are on top of the national polls that mean nothing (even though everyone talks about them). Instead, this is both an opportunity and a motivator for the Bulldogs. For starters, being No. 1 is an obvious tool for recruiting. People want to play for programs that get attention. UMD might not ring like a high-profile program, but the fact they are seen as good enough to be No. 1 in the country should help them along in this regard. Why is it a motivator? Well, there are two reasons. One, no one wants to lose the top spot after one week. You want to make a habit of staying there for a while, and that's hard if you lose on the first weekend after you gain the spot. Secondly, there are always going to be a lot of people who believe the No. 1 team doesn't deserve to be in that spot. Nothing like going out and beating a ranked team twice on the road to prove yourself as worthy. In the end, the No. 1 ranking is meant to be lost. We've already had four No. 1 teams in seven weeks of polls. UMD won't keep it forever, but hopefully they find a way to hold on to it for at least one more weekend. The Badgers are young, but they have some serious talent. Mark Zengerle and Michael Mersch up front are having nice freshman seasons. They unquestionably miss the slew of great players they had on last year's NCAA runner-up team, but Mike Eaves reloaded quickly. It helps to have guys like Jake Gardiner and Justin Schultz on the blue line, and the goaltending of Scott Gudmandson and Brett Bennett has been rock-solid all season so far. The Kohl Center is a hell of a tough place to play if you let the crowd get into it. The Badgers will come close to filling the building for both games, and it will be loud. It's up to UMD to find ways to take the crowd out of the game, so the home team can't feed off that energy. That means they need Fontaine and the Connollies to start with energy. Play tough. Play physical. They need someone to throw a hit. Make the effort plays early in the game. Get pucks deep and pressure the UW goal. Don't take dumb penalties or lazy penalties. Don't give the Badgers power plays. Those are things that beg for trouble against a desperate home team. Aaron Crandall should be motivated. He once had an offer to attend Wisconsin, but the Badgers yanked it as he struggled in juniors. He showed up as a third goalie for UMD last year, took a redshirt year by not playing, and has emerged as a viable starter. He might downplay it to your face, but it's hard to imagine he hasn't thought about it this week. Everyone has to play well. So far, the Bulldogs have been good at getting contributions all over the roster. They'll need more of the same this weekend. It won't be easy, because you know Wisconsin will be desperate after last weekend. But who said being No. 1 was easy? Player safety has become a hot-button issue in the NFL, as well as the NHL. For football fans, the league's decision to make some changes to how illegal hits are dealt with -- as well as the general definition of an illegal hit -- has brought up some questions about the game's future. While many of the people crowing about the league trying to take hitting out of the sport are just misguided, and the thought that the NFL is "wussifying" football is generally cringe-inducing, reality is that the league is studying ways to make football less dangerous. There is an acknowledgment from most proponents of these safety measures that nothing the league does will fully prevent the possibility of players being stretchered off fields with potentially serious injuries. The game is just too fast and too violent to do that. Instead, the NFL is spending their time and energy trying to make things as safe as possible. One of the potential measures was reported by former NFL general manager-turned CBS commentator Charlie Casserly on Sunday's NFL Today. ... as part of the league’s ongoing effort to enhance player safety, the NFL will consider the possibility of widening the field and the hash marks. The thinking is that opening up the field could make the game safer. While player safety continues to be a noble and important cause, it's not likely that this measure will be passed without resistance. As Mike Florio notes on PFT, we've already heard thoughts from a Pro Bowl safety that indicate this isn't a terribly good idea. Steelers safety Troy Polamalu, who gradually become the most outspoken player against the league’s stance on illegal hits, is now blaming the shift to wide-open offense. Polamalu might be wrong to go after the commissioner like he has over the league's stance, but his point is an interesting one. The fact that you have more room for guys to run around isn't going to make the game safer. Even if it does, that improved safety will only last until the players become faster and more capable of covering that extra ground quicker. Once that happens, the game will become even more violent and dangerous than it is right now. Not only will widening the field not make the game safer, but it won't make the game any better. As proven in college hockey, a bigger playing surface doesn't always equate to more exciting or wide-open action. The logic in hockey is a bit different, because by widening the playing surface, you're taking players (and, as a result, the puck) farther away from the goal. But in the end, making a football field wider doesn't mean you're going to make football better. Just ask the CFL. After all, if the wider field meant people would like the product more, they'd probably have more than eight teams in the CFL, and they'd probably have more than a crappy TV deal on NFL Network in the United States. A little flipping of teams at the top. I feel that the teams that have strong defenses -- Boise and TCU -- probably have the edge in the end, but I like what I saw from Auburn this week. They are shrouded in controversy right now, but they put on a gutsy performance Saturday and deserve a bump. Oregon's offense sputtered against a good defense, which might not be a great sign going forward. Karma is coming, Bret Bielema. Just hasn't hit you yet. How much fun would a Nebraska-Oklahoma State Big 12 title game be? I think it would be lower scoring than the first meeting. Look out for Texas A&M. Mike Sherman has them playing very good football. What the hell happened to Utah? How happy is Boise State over Virginia Tech's surge? Yes, it's a bad play on words. The UMD men's hockey team is the nation's new No. 1 team, according to polls conducted by USCHO and USA Today. It's been over six years since the last time the Bulldogs were No. 1. The numbers certainly are eye-catching so far. The Bulldogs are 9-1-2, marking the best start in the program's history. They lead all of Division I with those nine wins. They are in first place in the WCHA, ahead of a team that hasn't lost a league game ... ever (Nebraska-Omaha). It's a hell of a start for UMD, but in the end, they know it's just a start. While some fans might actually look at this as some sort of curse, there isn't anything negative about it. 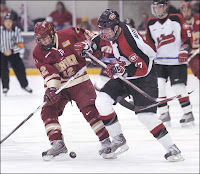 "It's exciting for UMD hockey," assistant coach Brett Larson told us on The Fan 1490 Monday. "We're gonna tell them, 'Congratulations, guys. Your hard work is starting to pay off.'" Bottom line is that this is a blessing for UMD hockey. Not a curse in any way. Yes, the No. 1 ranking in the regular season is meant to be lost. The only team that is guaranteed not to lose a No. 1 ranking is the team that wins the national championship in April. Other than that, the voters are just waiting for the No. 1 team to slip up so they can vote someone else in that position. But that shouldn't stop anyone associated with the program or a fan of the program from celebrating. UMD doesn't get here very often. The last time they did, they didn't stay, and the fall was gradual throughout the season. This time, there could be a second chance. The Bulldogs might not be good enough to sweep Wisconsin this weekend, which means they'll probably give up the No. 1 spot next week, but they are definitely good enough to stay in the mix for that ranking in future polls. Enjoy the ride, UMD fans. Don't bellyache about the good things. Greetings from a not-so-snowy DECC, which runs completely counter to my totally snowy home in nearby Proctor. What a difference a hill can make. 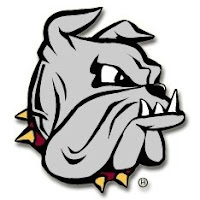 Anyway, UMD scored five straight goals after trailing 2-0 to win on Friday. Now, it's time to try for another WCHA sweep. These are tough to come by, so the more you have, the better. Apologies for no preview this week. No excuses. Just lazy. Anyway, we come to you from the DECC, where UMD has just four home games left before the opening of Amsoil Arena Dec. 30, and they get to tackle another longtime nemesis in Michigan Tech. To give you an idea how much of a pain in the neck this team can be, UMD was the victim in two of Michigan Tech's five wins last year. The Bulldogs just haven't played well against Tech over time, in part because of the Huskies' ability to play well on the smaller sheet at the DECC, and in part because of UMD's long-standing ability to play to the level of their competition. Just wanted to throw up a quick update on Denver senior forward Jesse Martin, who was seriously injured on a hit by North Dakota senior Brad Malone a couple weeks ago. Malone, as you may know, had a hard time dealing with what happened, and Martin actually called him to try to ease his mind. All around, it's been great to see, because Malone certainly didn't mean to do what he did. While Martin was undoubtedly the victim here, no matter how you slice it, Malone also had to recover in a way. Watching him play Saturday against UMD, it didn't appear he was holding back much. Malone was suspended for one game, missing Friday's win over UMD, while Martin may never play hockey again (the exact prognosis is still uncertain). Monday, Martin underwent surgery in the Twin Cities to stabilize multiple C2 neck fractures. His father reports that the operation went well and Martin has a good chance to live a "real good lifestyle." 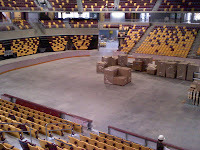 As we get ready to close the door on the DECC for the final time as a UMD hockey venue, UMD is preparing for a very special night Dec. 4. That's the day of the DECC's final men's hockey game, as UMD hosts Denver. While fans fight for the right to unbolt their seats and take them home, a number of UMD hockey legends will be honored and (hopefully) we'll get to see a few of them in the flesh. Ahead of that big night, UMD has announced its All-DECC team, chosen by a group of UMD alumni. As you can expect, there are some great names on the list, representing a lot of UMD hockey history. Read all about it after the jump. If you haven't yet picked up UMD men's hockey season tickets at Amsoil Arena, you still have an opportunity to get tickets and pick your seats. This chance will come on Sunday afternoon at the new facility. The university has announced a special one-day sale that will take place Sunday, less than two months before the rink hosts its first game on Dec. 30. Details are available after the jump. TCU moves way up for two reasons: 1. They beat a team I believe is as good as anyone Oregon or Auburn has beaten on the road, if not better. 2. They beat that good team 47-7, and by the way, did I mention it was on the road? Holy crap. No one has done that to Utah since Kyle Whittingham has been their coach, and it's not likely to happen again anytime soon (Boise won in Salt Lake City 36-3 in 2006, which is the only massacre that comes close to this). No one else deserves to lose a spot in the top four, but such is life. Any of the four playing for the national championship would be just fine in terms of entertainment value. Give credit to LSU. They keep finding ways to win, even though virtually everyone thinks their coach is a moron. Does this mean Alabama has no shot at the national title? Or do they still have to lose again? Take you pick at the bottom of the poll. I just filled it out because I'm required to vote for 25 teams.